Athens Alzheimer Association is a non-profit organization founded in 2002 by people with dementia, their relatives and health care professionals interested in Alzheimer’s disease. It aims to raise awareness of all forms of dementia and improve the quality of life of people with dementia and their families. Currently the Association numbers 4550 official members, has a staff of 43 health professionals and 45 active volunteers and is run by a 7-member elected board. Athens Alzheimer’s Association runs four Day Care Centers in Athens, offering daily care to people affected with Alzheimer’s disease or other forms of dementia. The Centers’ staff consists of a number of physicians, psychologists, speech therapists, social workers, nurses and physiotherapists, as well as administrative personnel. The Association Memory Clinics offer neurological and neuropsychological evaluation to people over 60 and provide timely and accurate diagnosis of Alzheimer’s disease and other forms of dementia. Nonpharmacological interventions for people with dementia include: cognitive training sessions, physical training programmes and other specific therapies (art therapy, speech therapy, occupational therapy, reminiscence therapy), individually or in groups. The Association organizes numerous educational programmes and support groups for caregivers of people with dementia. Educational seminars (eight 2-hour sessions) take place on a regular basis during the year teaching family caregivers how to deal with the practical and psychological burden of dementia. The psychological burden of dementia is an important, yet underestimated aspect of dementia. Compared to the general population, caregivers are in greater danger of developing depression and various psychosomatic conditions. The Association offers psychiatric support to relieve them from their psychological burden. The Alzheimer Athens Home Care programme is designed for people with dementia who do not have access to the Day Care Centers’ services due to mobility problems. The programme aims to enable persons with dementia to remain in the community for as long as possible and avoid institutional care. Health care professionals visit people with dementia at home on a regular basis and offer nursing services, physiotherapy and cognitive training to people affected and counseling or psychoeducation to their caregivers. “Alzheimer Café” is an intervention for people with dementia and their caregivers. It takes the form of a social gathering and promotes discussions, exchange of information about dementia, sharing of experiences, emotional support and socialization of its members. All the above services are provided free of charge. The Association publishes leaflets and booklets about all aspects of dementia and a quarterly magazine, all distributed free of charge and available on the internet. Dr Sakka has also been assigned President of the National Observatory of Dementia and Alzheimer’s disease, an independent strategic public institution overseeing the implementation of Dementia Action Plan and providing guidance to the state regarding dementia issues. You can read the Greek Dementia Plan online or download it here. Α national dementia registry is underway by the Greek Ministry of Health. There are currently 200,000 people living with dementia in Greece and 400,000 family carers looking after them. Although there is a National Action Plan for dementia and Alzheimer’s disease in place and there are Memory Clinics and Day Care Centers for people with dementia in the large cities of Greece, compared to existing needs, services are woefully inadequate. Large areas of the country are not covered by any specialized facilities. Athens Alzheimer Association (AAA) in collaboration with the Greek National Network of Healthy Municipalities has developed a project called “Building Counseling Services network for Dementia within municipalities all over Greece” which aims to provide care to people with dementia and education and support to their carers in the local communities. PHASE A: April-October 2018: 133 health and social care professionals from the 55 municipalities from all over Greece participated in online synchronous and asynchronous training via virtual specially developed training platform. 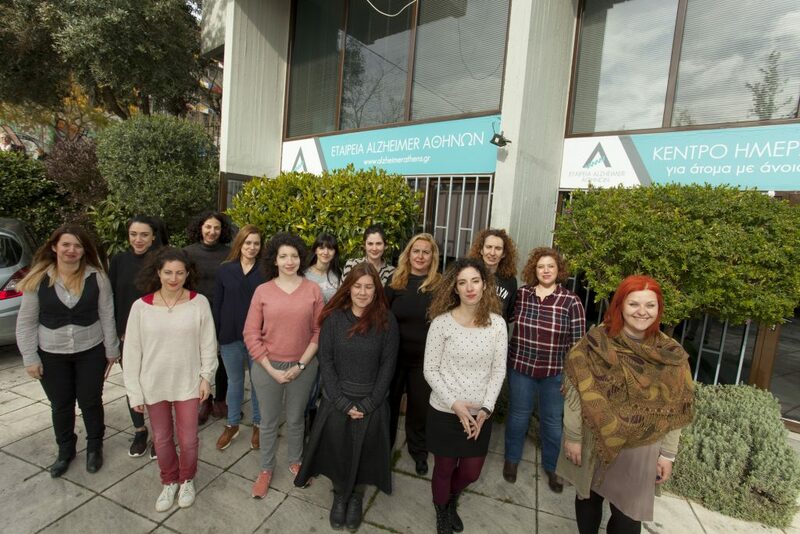 Training consisted of eight 2-hour classes, followed by practical on the job training at the Day Care Centers of Alzheimer Associations in Athens and Thessaloniki. 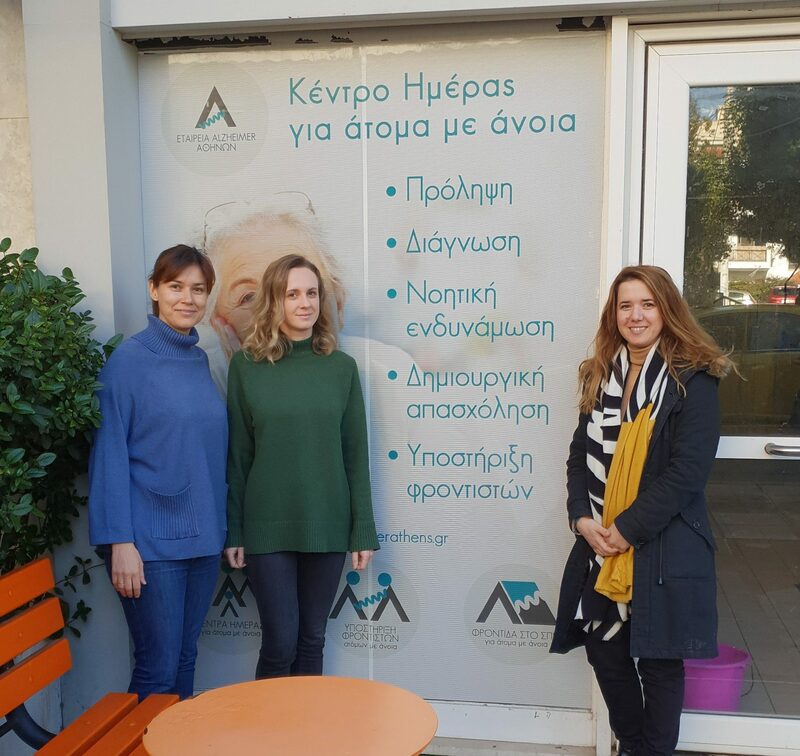 Greek Alzheimer Associations have committed to support the municipal Dementia Counseling Centers with regular visits of experienced health professionals, printed material, seminars and events for the first 2 years of operation. A dementia friendly community is a place or space in which people with dementia and their carers are empowered and supported. For people living with dementia to remain engaged within their communities, businesses and organisations need to demonstrate awareness, respect and responsiveness. For this purpose Athens Alzheimer Association is running an educational program specially designed for their employees in order to make these places dementia friendly. ● Encouraging organisations to establish dementia friendly approaches and implement strategies that help people with dementia. ● Training employees to recognize the person with dementia and behave accordingly. ● Building physical environments, accessible and easy to navigate for people with dementia..
● Raising awareness amongst employees to prevent dementia and eliminate stigma. ● Supporting employees/colleagues who care for a person with dementia. 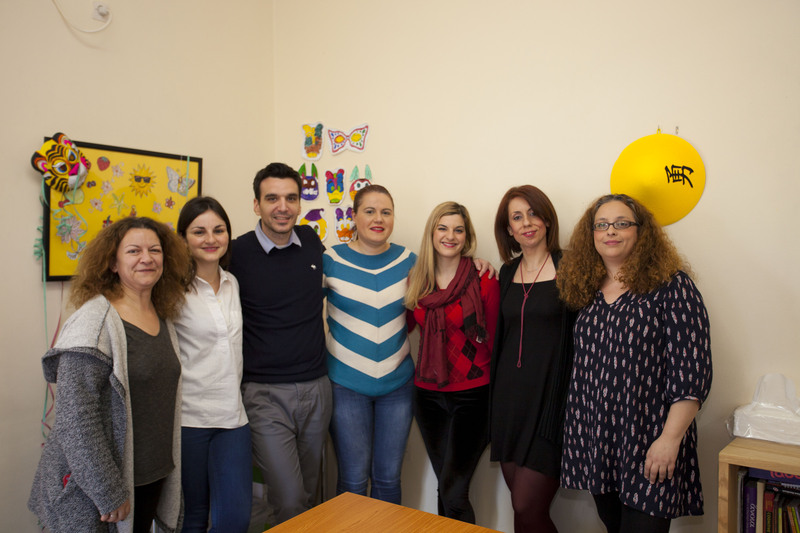 Overall, our aim is to lay the foundations for the creation of dementia-friendly communities in Greece. Our inspiration of a dementia friendly community includes friends, neighbors, lay people, shops and businesses, children and young adults and all involved stakeholders that understand and appreciate the condition. It is a community where people with dementia will live as independently as possible and they will be valued, understood and respected.